ALSO NOTE (to comply with DoD and International Traffic in Arm Regulations (ITAR) Part 121): No weapons, ammunition or un-demilitarized hardware included - just the Suit itself. No international Sales or Shipping. 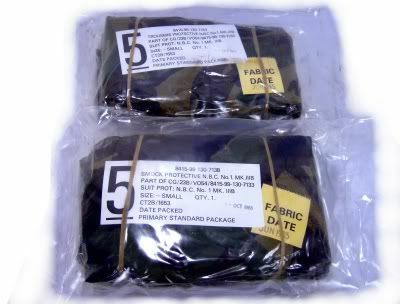 The NBC suit No.1 Mk.III was the standard chemical protection suit issued to members of the armed forces. Consisting of a Smock with hood and trousers which was worn over the uniform with the webbing on the outside, it was not the most comfortable thing to wear. Even though we opened one to take the above pictures, your 2-piece suit will come in unopened vacuum sealed pouches as pictured below along with original bag that it was issued in. 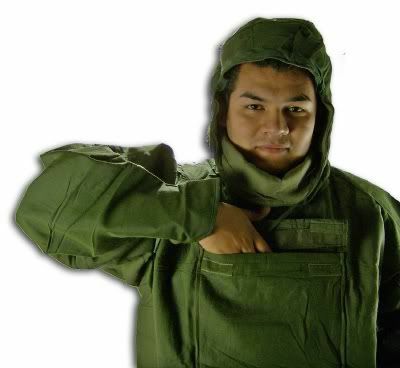 The MK IV NBC Suit is worn in conjunction with a respirator, gloves and overboots, and gives protection against all known chemical warfare (CW) agents. The life of the suit in operations depends on the level of attack. In most situations it can be worn for up to a month and still offer protection to the wearer. Under extreme conditions of multiple attack it may be necessary to change the suit after 24 hours. 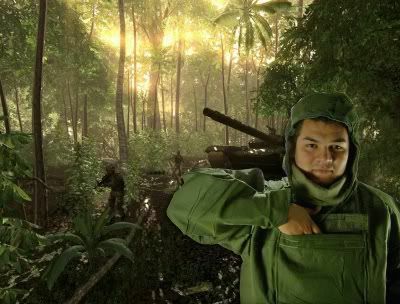 It is intended that the protective suit should be worn over normal combat clothing. The constituent materials have, therefore, been selected to impose minimum physiological stress, which is obviously a potential hazard in any closed system. In addition to providing protection against toxic agents in both liquid and vapor form, the suit is also self-decontaminating by encouraging rapid evaporation. Furthermore, by virtue of its flame retardancy, it offers a high level of protection not only against conventional fire, but also against the thermal pulse resulting from a nuclear burst. The MK IV is a two-piece suit consisting of a smock and trousers. 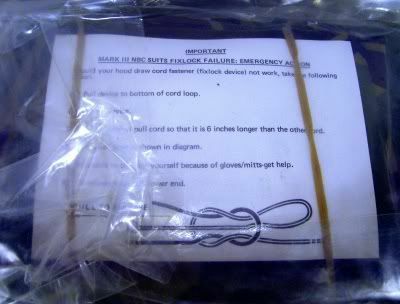 The smock, which is single-breasted, has a front opening which can be closed with a slide fastener and also touch and close tapes. It has an attached hood with elasticized face opening, which gives a good seal around the respirator. Touch and close strips are also provided at the cuffs and hips to allow easy individual adjustment for size. Bellows type pockets, with stitching penetrating only the outer layer of the main suit are provided on each breast and on the right sleeve, a patch pocket with divisions for pens is fitted on the left upper sleeve. The trousers are of pajama type with a gusseted front end with brace tapes sewn at the back, and loops at the front to give over-the-shoulder braces which can be tied at the front. Waist and lower legs can be adjusted by Velcro fasteners. Bellows type pockets are provided on each thigh, together with detector patches. Both smock and trousers are designed with the outer in inner layers of fabric constructed separately and only joined at the edges, thus reducing any possibility of ingress through stitch holes. The complete suit is constructed from two layers. The outer material is made of monacrylic fibers reinforced with polyamide fibers. It has a strong, hard-wearing outside surface. The monacrylic fibers ensure high fire-retardance. A silicone treatment is applied to make the garment shower-proof, and to permit rapid spreading of liquid chemicals, which in turn speeds up evaporation. This reduces the loading on the second layer, whose main function is to act as chemical barrier. The inner fabric is based on activated charcoal as a means of protection against toxic gases and vapors. Since this material alone is not sufficiently strong, it is bonded to non-woven fabric which is flame-retardant. A fluorocarbon finish is applied as an oil repellent, thus acting as a further barrier to toxic liquids. This combination of repellents represents a chemical barrier which is highly efficient, yet air-permeable and thus imposes low heat stress. This liquid control system formed by a wicking layer over an oil-repellent layer permits the incorporation off less charcoal than in other systems, which in turn results in a lighter garment and smaller package size. 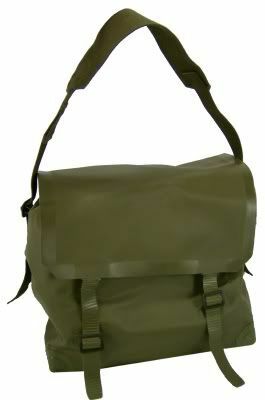 Great for Hunting or for Commercial Applications! !